Hey guys just a quick post today. I’m sharing a sweet little country chic inspired greeting card created with Plaid Flower Tags Digital Collage Sheet from my shop. 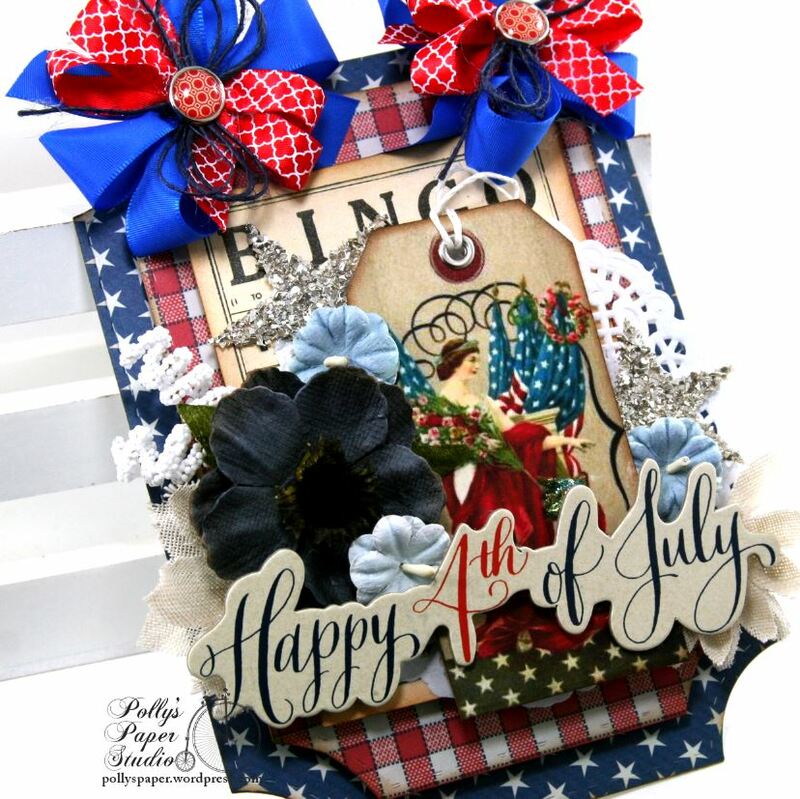 Please enjoy this video tutorial on how I created the card…..
You can follow Polly’s Paper Studio on Youtube HERE for more crating inspiration. Hello there Peeps! I’m happy to announce that we have a bit of a warm up here in Michigan. This morning it’s 52 degrees. This does good things for my disposition. I was in such a better mood that I was inspired to throw myself into Valentine projects. I printed myself a copy of the Valentine Post Cards and Tags Digital Collage Sheet from our shop and created 3 very shabby and vintagy projects. This card has a very untraditional color scheme. I coordinated the papers to the wrap on the cherub. 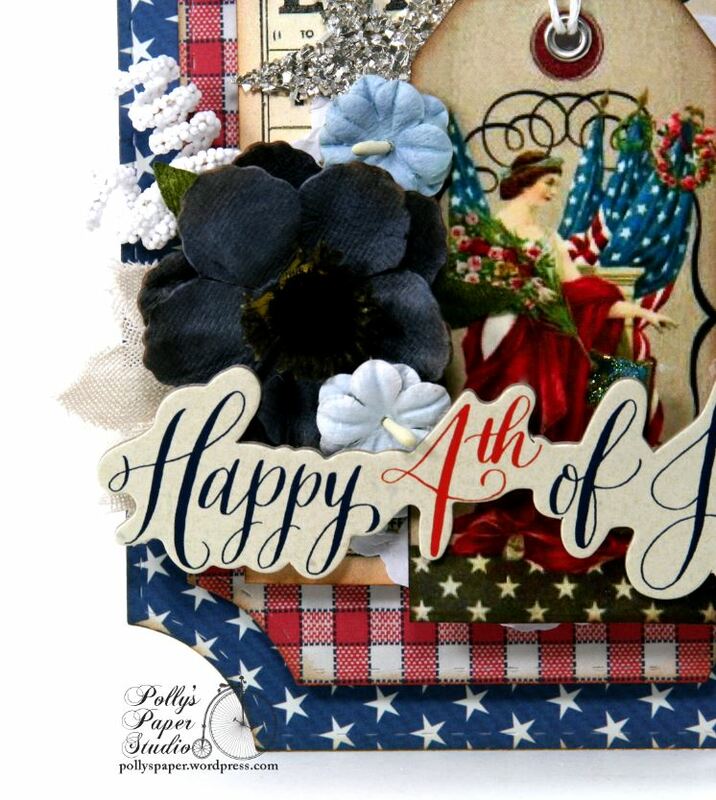 Altered chipboard, flowers, twine, sequins, and metal embellishments are the perfect accents. A sweet and simple tag has soft colors and vintagy finishing touches. Using spacers between the layers build depth and interest. The cherub tag on this card inspired the peachy pink colors from the paper patterns. Stickles added sparingly brings out the details on the vintagy image. I layered die cuts here and a rather generously sized flower arrangement. Please enjoy this video tutorial I’ve created for this card…..
Polly’s Paper Studio~ Be Mine Vintage Valentine Greeting Card, Shabby Chic Inspired Greeting Card, Shabby Chic Valentine Doves Tag, Valentine Post Cards and Tags Digital Collage Sheet. Really Reasonable Ribbon~ Ivory Burlap String, Swiss Dot Grosgrain Pink. Hey there Peeps! Well as you can see I’m late getting my post up again lol. Blame it on the nog and cookies : ) Or blame it on me sleeping in???? Either way I think it was worth the wait. I’ve created some really sweet and vintagy New Year’s Greeting cards with the new Dollar Download Vintage New Years Printable from our shop. I like the idea of New Year’s cards for just that holiday….but they come in very handy if you’ve just not gotten out all the Christmas cards….or drat forgot someone on your list and got a card from them ( it happens to all of us) I think this is a good recovery. Please enjoy this Video Process Tutorial I have prepared for how I created the Winter Bird New Year’s card…. Hey there Peeps. Well you all know I would get into that new Retro Santa Digital Collage sheet and have some fun playing with the tags. I’ve prepared a short video to share the projects I created….. If you enjoy the video please give me a thumbs up and if you are not already click subscribe so you won’t miss out on all of our future videos. Hey Peeps! Well it’s another busy busy busy day here out on our little slice of the countryside but I do have just enough time to share a new collage sheet that has vintagy button cards with gorgeous butterflies!!! I’m going to use it to make tags and cards and banners and just about everything else lol. And best of all they are part of our Dollar Download section. You can get a set of your own here……Butterfly Button Cards. Happy 1st of the month peeps! 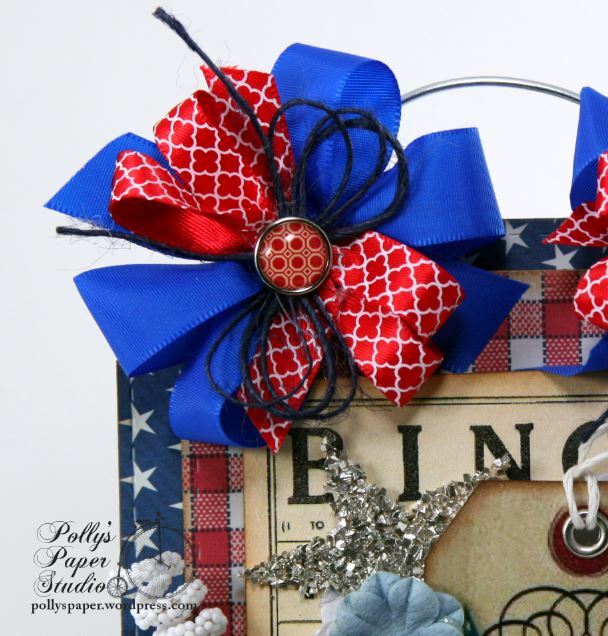 Just dropping in to share my first project with the new Patriotic Assortment Ribbon Club Selection. This will be perfect for all the summer holiday projects! Great solids with fun and festive patterns! I created a wall hanging just because I was in the mood to make extra bows lol. Stars and stripes are my favorite Americana themed patterns. I die cut the base and added layers of 110 lb cardstock to ensure that it would be nice and sturdy. 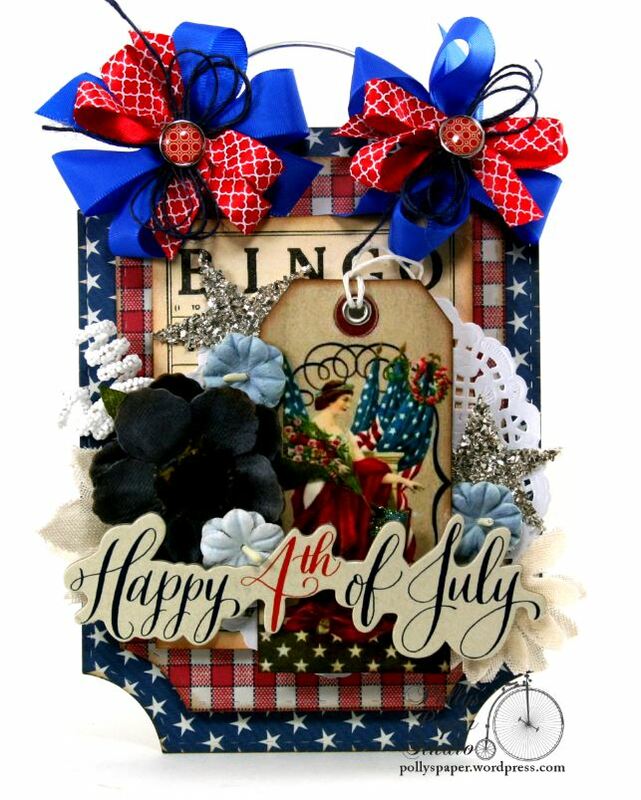 The focal image is a digital tag from my shop Patriotic Tags Collage. It’s got a metal eyelet with thick twine pulled through and glass glitter stars peeking out from behind. 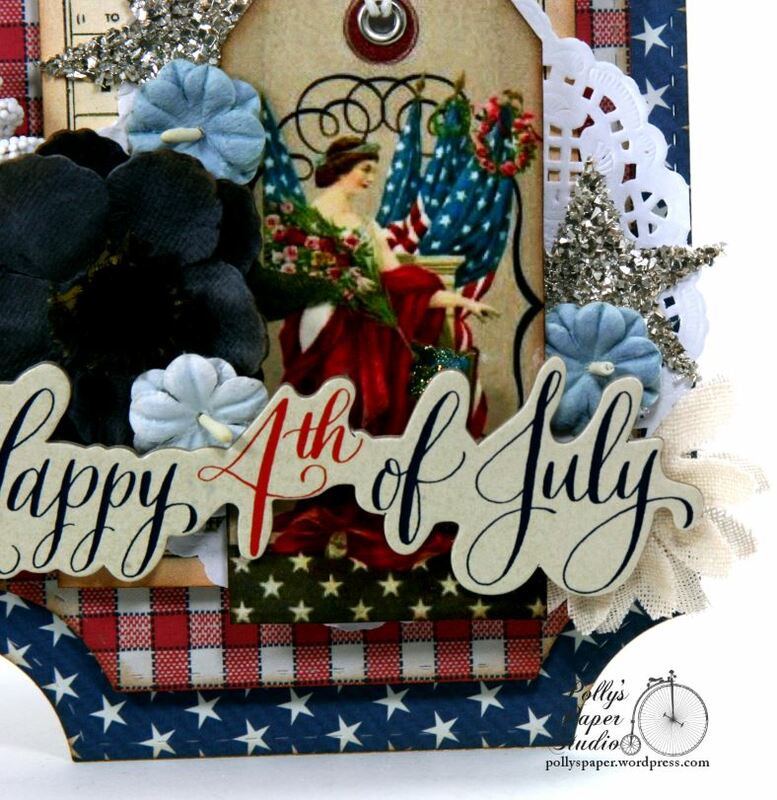 Coordinating flowers are layered in with Spiral Stamens and a large chipboard sentiment. The crisp white paper doily works great to break up the busy patterns. Isn’t this bow fabulous??? There’s a solid taffeta with the satin quatrefoil on top then twine and last but not least an epoxy patterned brad. Petaloo Flowers~ Darjeeling Blue Anenomes. Hey there! Time again for another fun hop at RRR. We’re sharing the projects we created with the Aqua Ribbon Club Aqua and Coral Mix. You should be coming to me from Gloria. 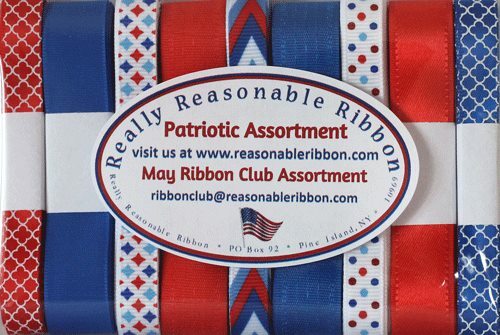 If you’re just joining in you’ll want to head on over to the Really Reasonable Ribbon Blog to start at the beginning. So I’m sharing many projects today as I’ve created a really great new Butterfly and Clocks Tags Digital Collage Sheet and once I printed it I was having so much fun I couldn’t stop. The great thing about this sheet besides the fact that it’s a Dollar Download Item is that you can create 3 finished tags with the sheet just as it is. Or if you’re like me…you can add extra emebllies to incorporate your own personal style. The first one on the left is created just by snipping out the images and assembling the layers. I added some 110 lb cardstock to the back as well to make them more sturdy. Topped off with my RRR trim it’s gorgeous and ready to add to a gift or to label a baked treat. The one on the right has some mixed media supplies added to antique the images a bit and then was assembled with foam spacers between the layers. More trims, a metal eyelet and lace kicks it up a notch. These tags have the same images but I’ve added chipboard, dimensional flowers, and metal embellies. I’ve taken the tags a bit further now and added one to a card base with simple cardstock and an embossed texture. I’ve wound the ribbons and lace around to create a coordinating background that shows off the focal tag as the centerpiece. And last but not least…my favorite. I dug in my stash just a bit to find some patterned papers that matched the butterfly and created a larger tag to adhere a die cut doily, the printed and snipped images, flowers and more of the beautiful RRR trims. I could have kept going all day as there are so many great uses for tags. And at only $1 for the download file I’ll bet you’ll have a hard time stopping too! Butterfly Clock Tags Digital Collage Sheet available for instant download. Your next stop in the hop is Judy!